Twenty-three years ago, Boston's town fathers (and mothers) struck upon a wonderful idea. Local merchants and entertainers would be enlisted in an effort to greet the new year in a spirit of community celebration. Storefronts would remain open throughout the night of December 31. In addition, artists and performers of all varieties would be engaged to entertain people of all ages anxious to brave the chill of the new England winter. My most vivid recollection of Boston's first "First Night" is walking through Copley Plaza towards Boston Common to view the ice sculptures sited along the freezing thoroughfare. More than twenty years passed until I ventured out into my second "First Night". Last year my family of five, including three children aged 12, 8, and 3, decided to travel with friends for the First Night festivities in Charlottesville, Virginia. This lovely university town is well known for its wonderful and architecturally significant university and its proximity to the home of Thomas Jefferson at nearby Monticello. It's First Night activities are rather less well known, and that is what attracted us. We didn't want to be overwhelmed by the festivities. And we hoped that the small town atmosphere of Charlottesville's main street would mean that both adults and children could enjoy the night without the press of a big city crowd. Charlottesville did not disappoint. It offered a variety of entertaining diversion for us all in a relaxed, well-ordered community atmosphere. I was told that the cold weather that night --it was after all December 31 -- kept attendance to a more manageable --but for the merchants, less profitable -- level than in year's past. I for one was not complaining. There are certain preparations a family should make before heading out for a winter's night of outdoor activity. It can get cold, sometimes very cold after the sun goes down. Winter boots are a prerequisite for those cold cobble-stoned streets, along with gloves, hats, and for the kids scarves to cover their faces. A thermos of hot chocolate or cider will also come in handy, and keep you out of the long line of shivering, less prepared customers waiting to buy something hot to drink. A supply of chocolate candy, as always, can take the edge off a dull moment, when waiting for the little trolley that your five year old must ride (for the umpteenth time) up and down the promenade. ﻿Charlottesville's First Night 1999 will be the community's seventeenth annual community event. While there are almost 200 such celebrations across the nation, Charlottesville has an esteemed vintage, second only to Boston, whose first night was inaugurated in 1976. It is important to note that Charlottesville's First Night is a dedicated family-oriented evening, meant to draw people of all ages together in a safe, community-wide celebration of the arts. While local restaurants and coffee and desert bars were thankfully open --and quite popular--and there were the usual trinkets for sale --the heart of First Night is the performances, concerts, and theatrical spectacles taking place throughout the late afternoon and into the night in the downtown area. Last year, more than 74 acts performed in 24 venues. The variety of performances and the number of locations meant that there was always something to see, and a seat from which to view it. This year's roster of artists once again stresses the showcasing of homegrown artistic talent, from the Appalachian Highland Dancers to the improvised group dances created by Katharine Birdsall, to the Covenant Sanctuary Choir and the East Coast Bluegrass Band and last but not least David Graham, the Hippie Magician. This year there will once again be creation stations along the Mall where kids can make hats, noisemakers, and masks. Arrive early and make them in time for the People's Processional on the Mall at 6pm. Kids can also take part in a production of the Wizard of Oz at the Old Mitchie Theatre and listen to storyteller Bill Wellington. 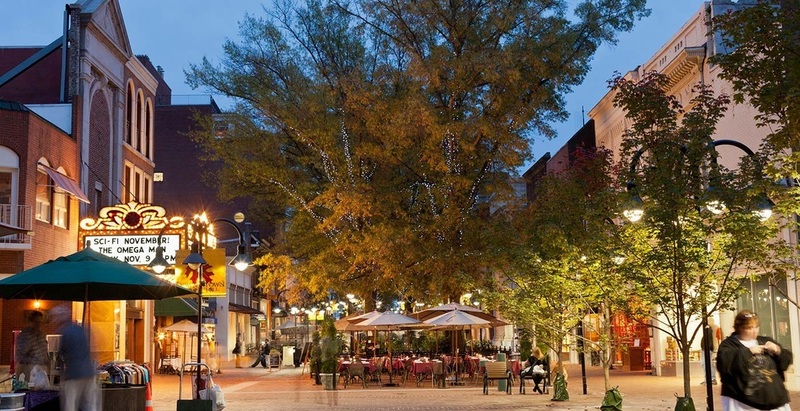 "Charlottesville's First Night is a dedicated family-oriented evening, meant to draw people of all ages together in a safe, community-wide celebration of the arts"
We chose the Omni Hotel at one end of the downtown mall as our base of operations. An indoor pool is always an advantage when traveling with young amphibians. And the hotel lobby not only served as the headquarters for first night registration--buttons ($8 for adults, $3 for children-- 1998 prices) served as entry tickets for all presentations. Its close proximity to the festivities -- a popular band even played in the ballroom -- also offered us an easy refuge when kids' toes got too cold. The thought that our cozy room was just steps away was a comforting thought as the night progressed. The real genius of our choice of accommodations, however, really became apparent when the New Year was welcomed with a grand fireworks display. We were able to enjoy the show from the warmth and comfort of our hotel room, which looked out upon the illuminated city skyscape. The community skating rink, just next door to the Omni, was our first stop on New Year's morning. All had slept well and, for the children among us at least, an early morning whirl around the indoor oval was just the thing to do.